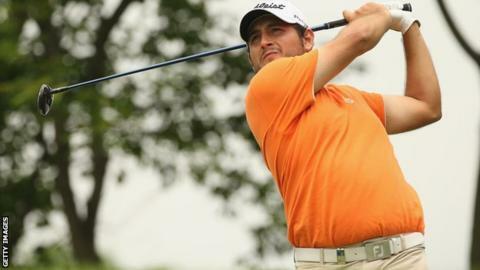 Alexander Levy fired a course record 10-under-par 62 to claim a four-shot lead at the halfway stage of the China Open in Shenzhen. The Frenchman, 23, who has never won on the European Tour, sank eight birdies and an eagle to move to 14 under par. Spaniard Adrian Otaegui is second, one ahead of compatriot Alvaro Quiros. Simon Dyson, who shared the first-round lead with Quiros, sits six under, level with fellow Englishman Tommy Fleetwood and one behind Scot Richie Ramsay. Ian Poulter had a double and triple bogey in his round and looked in danger of missing the cut, but a birdie on the 17th got him to one under and in the field for the weekend. Henrik Stenson is likely to miss the opportunity to overtake Tiger Woods as the world number one, with the Swede 11 shots off the pace on three under.